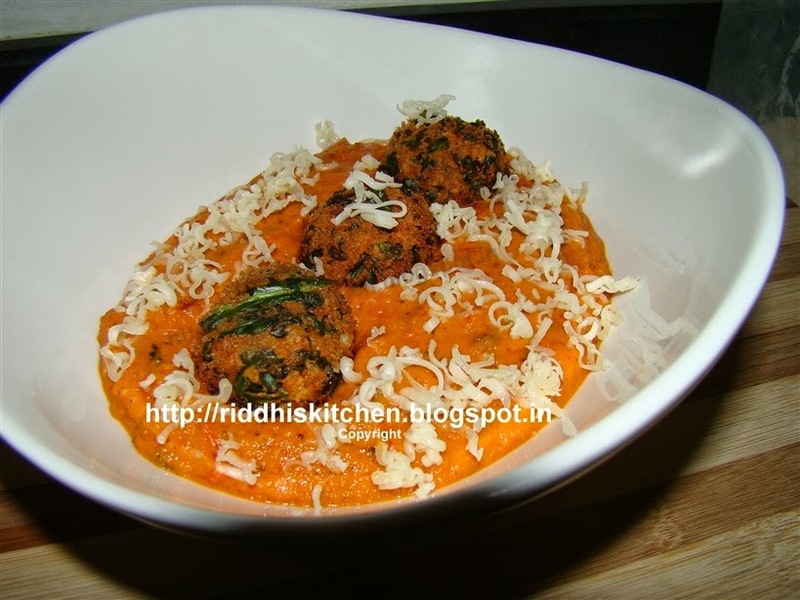 Mix all ingredients and shape into balls , roll them in breadcrumbs till they are well coated. Heat oil in kadai and deep fried on medium heat ,till golden and crisp. Take one pan heat 1 tablespoon oil. Add chopped onions, garlic, ginger and saute for 2 minutes. Add Tomatoes, cashew nuts and saute for 2 to 3 minutes. let it cool this mixture and blend it very well, make smooth paste. Take one pan heat 2 Tablespoons oil, add smooth paste, saute for 3 to 4 minutes. Add Red chilli powder,salt, garam masala, kasuri methi and mix well . cook for 1 to 2 minutes. Take serving bowl, add gravy, put balls into gravy and garnish with grated cheese. serve with paratha or nan.